An italian shopping list. This app enable you to keep in mind all the items you want to buy. 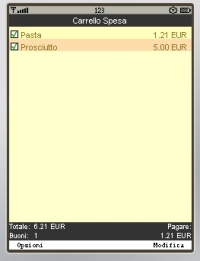 Moreover, you can set the ticket restaurant values. The app automatically calculate how many bonus you spent and how many money you have to pay. Use this TOP-rated app to find big sales & savings from your local stores!